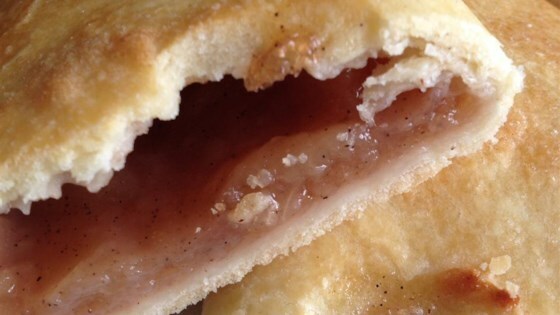 "Yummy, natural pie filling with no processed sugar. Can be frozen for later use. My hubby loves this, and refuses to eat any other apple pie. Adjust water and spices to your preferences." Mix apple slices with lemon juice in a large bowl to coat apple slices in juice. Stir water, honey, and maple syrup together in a large pot over medium heat until the honey and syrup are melted into the water; add vanilla bean contents and stir. Mix cornstarch, cinnamon, salt, and nutmeg together in a small bowl; stir into the water to dissolve. Bring the mixture to a boil and cook, stirring constantly, for 2 minutes. Carefully pour apple slices into the water. Bring water again to a boil, reduce heat to medium-low, cover pot with a lid, and cook at a simmer until apples are tender, 6 to 8 minutes. Remove pot from heat and remove lid to allow apples to cool to room temperature, at least 30 minutes.